With plenty of incredible things to do, it's no surprise that London, the capital of England and the United Kingdom, is a popular destination for families with kids of all ages. If you're visiting with teens, you might be wondering what do after you've checked all the London must-dos off your list. Once you've visited all the museums, the iconic "Big Ben" clock tower and Westminster Abbey, try entertaining your teens with one of these great activities, among our favorites for entertaining teenagers in London. Teenagers visiting London will love the opportunity to buy something that their friends don't have back home. Head to Topshop on Oxford Street for some grand High Street fashion. It's the flagship store, and it's big enough to spend a few hours in. It's also near to Carnaby Street which is flanked by cool stores like Monki and Jack Wills. At either end of Oxford Street, there are two large branches of Primark which sell cheap and stylish clothes, shoes and accessories. And don't forget London's many street markets. Camden Market is always a hit. London is home to some of the best street art in the world. The walls around east London are covered in work by ever-changing artists. Shoreditch in particular, near the Liverpool Street station, is always a great spot to start a street art walk. You're likely to see everything from intricate works by world-renowned artists like Banksy all the way to colorful tags by locals. Teenagers often enjoy photography and this would be an excellent opportunity to get some cool shots of 'real London' for them to post on social media. clueQuest, a live "escape the room"-style game, is great fun if you're traveling with a small group. Once locked inside a room, you have an hour to find a way out. You have to work as a team to solve the codes and puzzles, and you need to be over nine years old to understand some of the challenges truly. It's brilliant for families and friends, and they stay open late into the evening, too. Similar to clueQuest, The Escape Hunt is another "escape from the locked room" experience but with a Sherlock Holmes-style theme. There are 10 rooms with three different scenarios (so you can have competing teams trying the same task in different rooms). If your teenagers don't mind a bit of spook and enjoy history, they'll love reliving the city's past at the London Dungeon. At this South Bank attraction, there are 19 different live shows, along with two thrill rides, that recreate historical events in clever (and sometimes macabre) ways. Sticking with the spooky theme, an evening walking tour centered around the gruesome tales of Jack the Ripper in Victorian London is another option for older kids. The walk follows the streets around the East End where the murders took place, and the tour guides don't hold back with the gory details. The original tour began in 1982 and retraces the killer's footsteps and those of the Victorian-era investigators who were attempting to solve the grisly murders. Dining with teens isn't as tricky as dining with infants or small children, but we get it: It still has to be cool. Try Inamo in Soho, where you order your meal through projections on the table. Instead of reading about your food, each dish is projected onto the space where your plate will be so you can get a much better idea of what your meal will look like. The Pan-Asian menu is still broad enough to satisfy even the fussiest eater. And after you've ordered your drinks and meals, you can watch the 'Chef Cam' and see it all being prepared in the kitchen! There are also games to play to keep you entertained while waiting for everyone to finish. You can sit in the public galleries and watch trials in session from Monday to Friday between 10:30 a.m. and 1 p.m., and between 2 and 4 p.m. Some cases are more popular than others and as there is no reserved seating you may need to wait in line. Also, there are restrictions on what you can take in (no cameras, video equipment, mobile phones, portable music devices, bags, food or drink) and there are no lockers, so it's best to not carry anything with you when visiting. London's elaborate afternoon tea sessions can be appropriate for all age groups, provided you know where to go. During an afternoon tea service, you'll enjoy the tea of your choice and towers of scones, clotted cream, finger sandwiches, and other goodies. Some afternoon teas take themselves more seriously than others. For your teen's sake, consider tea at somewhere like Claridge's, whose award-winning tea is still very hip and fun for most teens. Beware that the top places in London usually have to be booked up to three months in advance, but don't fret—there are many other great places to try too. Why just visit the O2 when you can climb over it? Up at The O2 is a challenging but exhilarating experience that takes you 52 meters above ground level at one of London's biggest arenas. The walkway feels like an enormous trampoline as you climb up on tensile fabric. Definitely more fun than an urban climbing wall! Ice cream is not just for small kids, especially liquid nitrogen ice cream, which is flash-frozen at freezing cold temperatures to create an extraordinarily smooth treat. Want to try it in London? Check out Chin Chin Labs in Camden or Soho, where it's made on the spot! It's impressive to watch it being made for you and photos are allowed. It really is the coolest ice cream in town! Like it or not, celebrities play a big part in teenagers' lives and getting up close to some big names can be fun for the whole family. Madame Tussauds London is all about fun. Music plays when you arrive and you can hug your idols and get some great photo opportunities. There are pop stars and actors, as well as sporting legends and historical figures. London's cycle hire scheme is a great way to see the city. The bikes are quite heavy, but there are docking stations all over central London so you can cycle between attractions or just head out and see what you find. The scheme is run by Transport for London, and all of the bikes are maintained regularly making this a cost-effective way to get off the beaten track. TfL also has some suggested cycle route maps to give you some ideas on where to explore. If you want to take cycling to the next level, why not visit the Lee Valley VeloPark where the Olympic cycling events were held in 2012? There are BMX and mountain bike trails plus an awesome velodrome. It's always worth including a boat trip on The Thames on any trip to London, but that doesn't have to be a sedate cruise. Thamesjet is a super-fast RIB (rigid inflatable boat) that can travel up to 40 miles per hour (the speed limit in central London). It's good for sightseeing but great for thrill seekers. It's a bit like a water-based roller coaster with all the twists and turns. A short trip from central London, Kew Gardens is home to the world's most diverse living plant collection. Teens can explore a rainforest, getting up close and personal with coffee, rubber, and chocolate plants, or a treetop walkway, perched nearly 60 feet above the floor, among countless other exhibits of flora. To some, it looks just like a crosswalk. But to others, it's far more important. If any teens in your group are Beatles fans, you owe it to yourself to visit London's historic Abbey Road crossing, now the most famous street-crossing in the world, and the one where the Beatles shot their famous Abbey Road album cover. The crossing a now an English Heritage site. 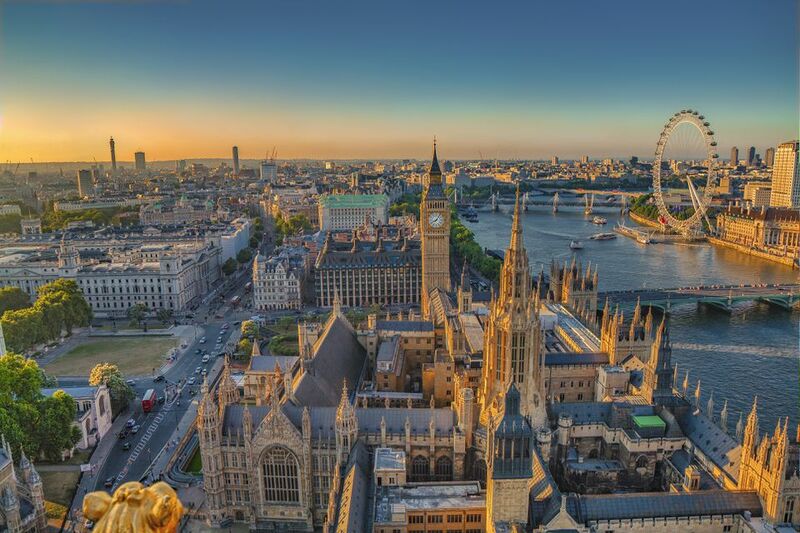 If you hope to get an eagle's eye view on London during your trip, no better way to do so than the London Eye, a 442-foot-tall observation wheel, among the tallest in the world. More than 10,000 visitors take the wheel to the top each day. At the top of the wheel, you'll be afforded a full, 360-degree panoramic view of the city. Teens will love the Medieval Banquet, a night of dining and theater held underground at the St. Katherine Docks, near Tower Bridge. Dinner is held in the 19th-century Victorian Ivory House. Throughout the meal, you'll be entertained by singers, contortionists, jugglers, and magician.